We are having a bi-coastal holiday season this year. Lenny is on the East Coast with his family, and I am on the West Coast with mine. This is the first Christmas in four years, that we have not spent it together. While it is wonderful being with our families, the distance during the holidays is bittersweet and tugs at my heartstrings every year. We hardly ever fight but when it is time for the holidays, and we are getting tugged by both families, it is the one time there are tears around our house. Which is a shame as the holidays are supposed to be a wonderful time of the year. We use to dream of entertaining at our home but since we don’t have space at this time, it is hard. Regardless of where we are, we wanted to be sure to wish each and every one of you a very happy holiday season and hopefully, you are able to spend it with the ones you love this year! Hopefully, you have time to bake a Christmas Wreath Bread for them as well. If we were hosting at our home for our families this would definitely be on the Christmas morning menu. Wishing you the very best this holiday season and in the New Year! In a large mixing bowl, dissolve the yeast in the water and let it foam up for a minute or two. Blend in the milk, sugar, butter, salt, cinnamon, eggs and orange peel. Stir in two cups of the flour, one cup at a time. Beat for 2 minutes. Add remaining flour 1/2 cup at a time until you have a soft, workable dough — you might not need to use all the flour. Dump the dough out onto a lightly floured work surface and knead until smooth, 5 to 10 minutes. Add more flour if needed to prevent sticking. Place in a lightly oiled mixing bowl large enough to accommodate dough when doubled in size. Cover with plastic wrap and let it rise in a warm place until doubled in bulk, about 1 1/2 hours. Drain the dried fruit from the liqueur and reserve the liqueur for another use. In a small bowl, combine the drained fruit with remaining filling ingredients. Cover and refrigerate. Line a baking sheet with parchment or non-stick baking mat. Carefully transfer the rope to the baking sheet and shape into a wreath, pinching the ends together to seal. Let it rise, uncovered, in a warm place until puffy, about 45 minutes. Preheat the oven to 350°F. Bake the wreath until lightly browned, about 25 minutes. While the wreath is baking, stir together the ingredients for the glaze and set aside. When the wreath is done, transfer to a cooling rack by picking up the sides of the parchment and then sliding the parchment out from underneath. Cool for a few minutes then drizzle the glaze over the warm wreath. Serve with extra butter if you’re feeling decadent. 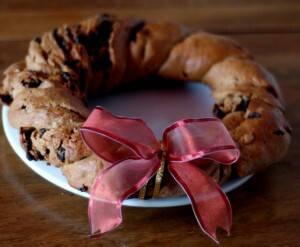 The wreath can be baked up to 2 days ahead of time. Do not glaze the loaf — let the wreath cool completely, then wrap tightly in foil and store at room temperature. Re-heat the bread at 350°F for 10 to 15 minutes, and drizzle with the glaze just before serving. 7 Responses to "Christmas Wreath Bread"
Beautiful bread wreath! I am glad it was inspiring - my mom made it for Christmas, too, and we thought it was delicious. Merry Christmas! Happy Holidays and New year to you two! XO! It must have been tough to be apart during Christmas. I just can't imagine it. Wow, the video is an amazing example of the wonderful adventures that you both experience! You both have fabulous trips together, maybe a few days apart isn't that bad? :D Thanks for sharing your great trips with us, your beautiful family and your amazing friends! BTW- LOVE the "X" girlfriends!! LOL!!! hahahaha!!! This looks awesome! I'll definitely going to try this someday! Thanks for sharing! I'm going to bake this one even though it's past xmas already because this looks so good. I want to taste this bread and also at the same time learn how to bake this. Thanks for sharing! For my own version, Id like to add dark chocolates since my family has a sweet tooth. I am thinking of just giving this away for Christmas as a food gift. Thanks for sharing!